Reston, Va. – A German multicenter study, initiated by the German Society of Nuclear Medicine, demonstrates that lutetium-177 (Lu-177)-labeled PSMA-617 is a promising new therapeutic agent for radioligand therapy (RLT) of patients with metastatic castration-resistant prostate cancer (mCRPC). The study is published in the January 2017 issue of The Journal of Nuclear Medicine and is the featured article. Prostate-specific membrane antigen (PSMA) is overexpressed in prostate cancer and even more so with castration-resistant disease. This makes development of new tracers for PSMA-targeted radionuclide therapies a promising treatment approach. Prostate cancer deaths are usually the result of mCRPC, and the median survival for men with mCRPC has been less than two years. At 12 therapy centers across Germany, 145 patients (median age 73 years, range 43-88) with mCRPC were treated with Lu-177-PSMA-617 between February 2014 and July 2015 with one to four therapy cycles. A total of 248 therapy cycles were performed in 145 patients. Efficacy was defined by a prostate-specific antigen (PSA) decline of 50 percent or more from baseline to at least two weeks after start of RLT. Overall, 45 percent of patients had a positive response following all therapy cycles, while 40 percent responded after a single cycle. Some adverse side effects were noted but manageable. Hematotoxicity occurred in 18 patients: 10 percent experienced anemia; 4 percent, thrombocytopenia (low platelet count); and 3 percent, leukopenia (low white blood cell count). Dry mouth was experienced by 8 percent. The study shows that Lu-177-PSMA-617 radioligand therapy is safe and more effective than other third-line systemic therapies for mCRPC patients. Future Phase II and III studies are needed to clarify the survival benefit of this new therapy, which is not yet FDA-approved. 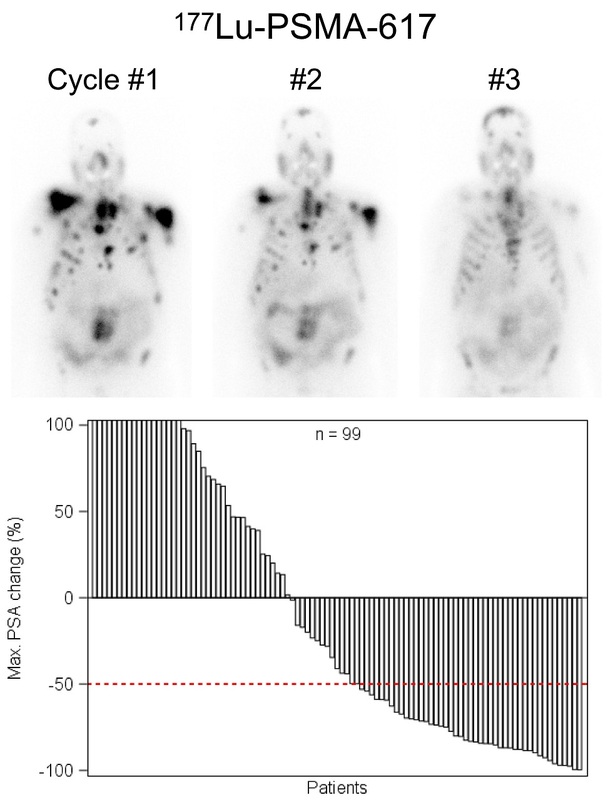 FIGURE CAPTION: Lu-177-PSMA-617 radionuclide therapy can reduce tumor burden and induce PSA remission in patients with metastatic advanced prostate cancer. Image credit: Kambiz Rahbar, MD, Department of Nuclear Medicine, University Hospital Muenster, and Wolfgang Peter Fendler, MD, Department of Nuclear Medicine, University Hospital Munich. Authors of the article “German multicenter study investigating 177Lu-PSMA-617 radioligand therapy in advanced prostate cancer patients” include first authors Kambiz Rahbar, University Hospital Muenster, and Hojjat Ahmadzadehfar, University Hospital Bonn; Clemens Kratochwil and Uwe Haberkorn, University of Heidelberg; Michael Schäfers, University Hospital Muenster; Markus Essler, University Hospital Bonn; Richard P. Baum and Harshad R Kulkarani, Theranostics Center for Molecular Radiotherapy and Molecular Imaging, Bad Berka, Germany; Matthias Schmidt, University of Cologne; Peter Bartenstein, Ludwig-Maximilians-University Munich; Andreas Pfestroff, University of Marburg; Ulf Lützen, Marlies Marx, Vikas Prasad and Winfried Brenner, University Hospital Berlin; Alexander Heinzel, University Hospital Aachen; Juri Ruf and Philipp Tobias Meyer, University of Freiburg; Martin Heuschkel, University of Rostock; Maria Eveslage and Martin Bögemann, University of Muenster; and senior authors Wolfgang Peter Fendler, Ludwig-Maximilians-University Munich, and Bernd Joachim Krause, University of Rostock and German Society of Nuclear Medicine, Göttingen, Germany.